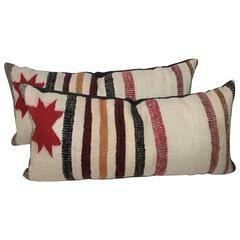 These three Navajo Indian weaving pillows are made from saddle blankets. The condition are all very good with cotton linen backings. Sold as a group of three bolsters. Purchase individually they are $995.00 each. 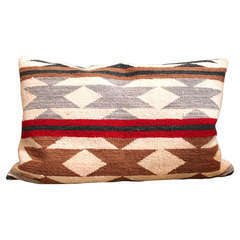 This large saddle blanket bolster pillow is in great as found condition. The backing is in black cotton linen. 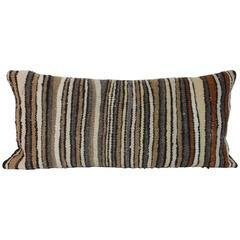 This is quite interesting for a Indian weaving bolster pillow. Stripes in neutral colors and great condition. Handwoven wool serape blanket from the highlands of Oaxaca, Mexico with traditional Mixtec symbols, circa 1950s. Beautifully handwoven wool Mexican serape blanket from Texcoco, State of Mexico, Mexico. Gorgeous Traditional Design in all natural pigments of indigo, cochineal, ivory and brown. Mixtec wool serape blanket, handwoven with traditional cloud and thunder symbols. Slit opening in middle for wearing. Hand knotted fringe.